All right, so anyone who knows me knows that I love the postal service. Not the indie-pop band so beloved by Maria Lucia when The Current first got off the ground, no, I mean the actual USPS. I'm involved in an international postcard-exchange program, Postcrossing, and I've even contrived to engage the intermittent friend in shooting a couple letters back and forth. Now I live in an apartment building where repairs are slow, recycling is non-existent, and where the hell do I drop off mail? None of my postcards will fit in the crude mail slot someone gouged into one of the compartments of the buildings mail bank. I did a quick online search to find out if there were any widgets or apps designed to locate mailboxes in my region, and there were a couple. 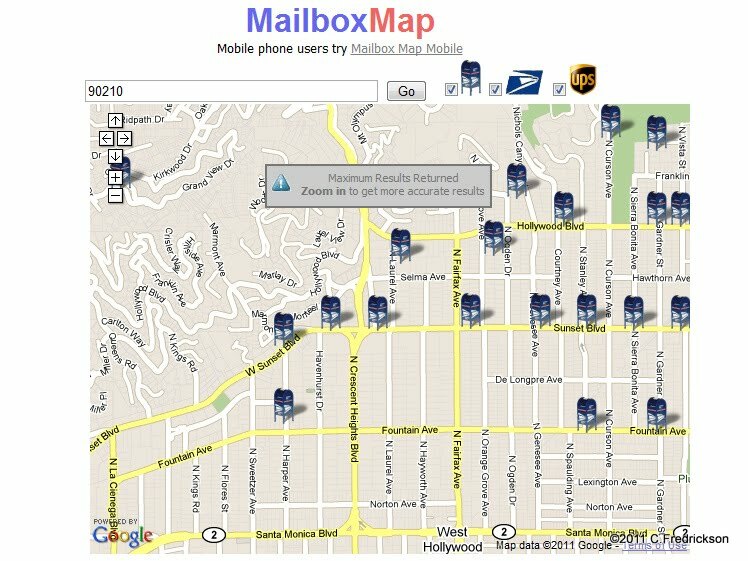 The one I liked the best is Mailbox Map, working with Google Maps to create a graphic layout of mailboxes, USPS offices and UPS offices. The only problem is that most of the mailboxes that come up in Mailbox Map don't actually exist. Fewer and fewer people write letters, and traditional mail services such as bills or banking are moving online. As a result, mailboxes shown to be in disuse are uprooted and hauled away. This doesn't affect most people, who live in a house with a personal mailbox, an apartment building with a good mail collection facility, or who work in an office where they can drop off outgoing mail. I realize I'm the exception and I'm not asking the USPS to please mount a personalized mailbox in my neighborhood just for the couple of postcards I send out each week. But I still want to know where any mailboxes might be, so I copied the above map into a hand-drawn sketch and went out on the town. Out of the ten listed mailbox locations, less than a third actually had a mailbox standing. There are a couple in front of the nightclub Ground Zero (Hennepin & SE 4th St), some upstairs of St. Anthony Main (SE 2nd St & SE 2nd Ave), and a few behind Union Bank and Trust (SE University Ave, between Central and SE 2nd Ave). ...and I just discovered the USPS has its own mailbox locator. I should have thought of that in the first place. Anyway, it generated five hits for my neighborhood and of these I can confirm one location, I know of one collection box they don't list, and they have a new one in an area I was unaware of. More work is to be done. Took two tablets of Miracle Berry, one each, and crunched into them. Hard and stale, had to lick them off our teeth and crush the granules. Grapefruit: tart like rind, but sweet like a mellow ruby red. Rebecca: It was very unusual, and in the realm of what grapefruit shoudl taste like, this isn't there. Sanpellegrino Aranciata: very sweet, none of the bite, like a high-quality orange soda. Organic cranberry concentrate: the high-end flavors of gellied cranberry, none of the acrid bite. The aftertaste is very sweet. Rebecca: It's like drinking cranberry concentrate with an undertone, a strong undertone of essence of cranberry, buried under a thousand pounds of heavily sugared huckleberry. Rice vinegar: Reminds me of another syrup or sauce that was stinging with fermentation on top but bodied with thick, golden sweetness. Residual strips of tang on the edges of my tongue. Rebecca: Oh my God, I said it perfectly! It's very intense and it feels like there's a high-energy chemical reaction going on down the front of the tongue that made me quiver. In-between samples we cleansed our palates with coffee grounds. Angostura Bitters: very dry and acrid, like thin strips of wood up my tongue. Behind that an alcolic ghost-cloud of musk, then sweetness coming in from the sides with exotic spices. Rebecca: It turned into a licorice thing with an aftertaste that dries your tongue and becomes a kind of pepper-cough syrup. Took two more berry tabs, tried sucking on them for a while. Tabasco: The heat comes through, but it's very sweet! It's a burning, spiky heat but I can handle it. All the vinegar and acid have turned to sugar, like a sweet-hot sauce in a Chinese restaurant. Rebecca: Initially tasted like Tabasco, but it was somehow wrong. Later figured out it was too sweet. (ran for gluen-free cornbread) it felt too hot, despite being highly intimate with Tabasco. TJ's raw almonds: differences are too subtle. clove of garlic: acid sting came through first, then the overall sharpness of raw garlic. No difference, though I thought it was mellowed for a second, but I was wrong. Coca-Cola: There is no bite. It's just sweet and muted, without the robust sweetness of Pepsi. ginger slices boiled in water. Rebecca: The initial taste of ginger water was mild and lacking something. Next I chewed a small piece and the power of the root came through. I could feel the heat, tingle, some of the aroma but the whole thing was muted. Other than the heat, actually. It wasn't bad but isn't needed in a nice ginger tea. I thought this was a formula for ginger tea. It was made for me like this in Indonesia and it is not only delicious there but works small miracles for which I can testify. I sliced up three slim coins of unpeeled ginger and swam them around in my coffee mug, filled with water, stuck in the microwave for 90 seconds. The formula came out tasting kind of weak. There was some ginger-like sting around the edges of my tongue but otherwise it was just a cloudy, weak, earthy water. Kraken rum and Jameson's whisky similarly received no benefit of alteration. Blogger Deleted Some of My Data! Infuriating: Blogger ejected all my linked blogs. I had two sets of blogs I link to in the sidebar, and today I went to add one and noticed that all of them were gone. Gone! Friends I'd made along the way, interesting blogs I found circuitously, stuff like that. I didn't Follow each one and I didn't add each one to my Reader list, they only existed in that sidebar. And now they're wiped out. To rectify this in the short term, I've added the blogs I follow from Google Reader. Already I have recollections of other blogs I'm now missing and if I were a better person I'd know how to find them again. (I also discovered several blogs that are no longer updated, indeed, don't exist at all. Cleaned those out.) I'm wondering if I can find a cached copy of my blog in, like, Internet Archive or something. Maybe that'll show all the places I linked to. I don't want to lose all those blogs! I'm still getting text messages for the previous owner of my cellphone's number. How sad is that? I bought this phone in the middle of April and have had this number for over two months. That means, in all this time, these "friends" of the previous owner haven't bothered to contact her in two months. Text messages and sometimes phone calls still come trickling in, though. Guys inviting her to go running. Girls inviting her to Valley Fair. Coaches wondering why she's not at practice and announcing upcoming meets. It's been two months. I hope this girl didn't go missing or something horrible like that. But the alternative explanation isn't favorable either: she got a new phone number and somehow forgot to tell everyone, or else no one was sufficiently curious to learn about it. I hope they see her every day and have little occasion to bother with a text message, if that's the case. That would be a good scenario. One guy didn't believe me when I tried to explain someone else had this number. He kept saying, "Okay, be that way." I didn't want him to get mad at the young woman (I've learned a lot about her, from all the messages I get) so I really tried to explain this happens all the time, people change numbers. It could be that youth no longer understands how to appropriately use "be that way" in a conversation and it means something else now. I mean, she sounds popular, based on the kinds of messages she gets. But the fact that no one knows how to reach her sounds like a matter for some concern. Heads-up to anyone reading this: I'm not renewing the domain name for this site. Instead of swevenvolant.org, please update links (ha ha, I'm sure this will affect millions of people) to swevenvolant.blogspot.com. My registrar's prices went up--as I'm sure every registrar's prices do--and it's not worth it to me to shell out even more money for a vanity URL attached to a blog I do nothing with. The name of the blog's still in the URL and if anyone ever, ever had any curiosity to find my site, it would be only too easy to do so. Seriously, seven bucks a year to start with and then sixteen dollars? And for what? I get zero customer service (unless I pay more for it) and I'm not asking them to host anything. Nothing's changed, nothing's improved, but I'm supposed to pay double for a fancy domain name. It doesn't seem fair to me.